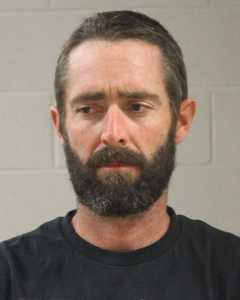 ST. GEORGE – Washington County Sheriff’s deputies arrested a 32-year-old Leeds man Monday for firearms theft after he allegedly stole four guns, two of which he said he used to pay off a drug debt. Deputies located Frank Nathan Madrid on the 400 South block of Silver Valley Road in Leeds to detain him for questioning about a theft case involving four stolen firearms, Washington County Sheriff’s Deputy Robert Tibbitts said in his probable cause statements supporting the arrest. “I informed (Madrid) that I had pawn tickets showing that he had recently pawned two firearms that had been reported stolen,” Tibbitts said in the statement. Madrid told Tibbitts he had been in possession of two firearms and that he did pawn them, the statement said. He also stated that he intended on giving the firearms back and believed he was lawfully in possession of them. After further questioning, Madrid admitted that he had been in possession of all four firearms reported stolen. Madrid was arrested and booked into the Washington County Purgatory Correctional Facility. He was charged with four second-degree felonies for firearms theft. According to booking records, his bail is set at $40,000. He probably just took the guns so Obama wouldn’t get them. We should let him off for that. We should commend this guy for placing those guns in the security of a pawn shop so that Obama couldn’t take them. Imagine Obama’s frustration of arriving at the house to take his guns and finding them gone. Evil Twins Mommy I’ve seen your kind and loving comments on all of these poor misguided individuals today who have run afoul of the evil men in blue and brown. I agree that they should get love and affection, and find it so generous of you to bail them out and allow them to move into your home with your family. This is the ultimate expression of the Christmas Spirit. In order to help you with this fine work, let me know where to send it, and I’ll send you two bits to assist with it.